One of my favorite aspects of flights to Europe (and there are very few; Europe is great, nine-hour flights are not) is the necessity of crossing over Greenland. When the weather is clear, the views of this icy alien landscape are just stunning. Our flight home from Paris in 2006 was one of those trips, with just a few clouds over the highest part of the (really big) island. So what do you all think of this glacial feature? What's going on here? How sad that the WSJ and CNBC have so little conception of what science really is, especially since scientific advances drive so much of the economy. If that's what Jenkins thinks science is, one would assume he is equally skeptical of flossing, antibiotics and even boarding an airplane. In fact, science doesn't work by consensus of opinion. Science is in many respects the exact opposite of decision by consensus. General opinion at one point might have been that the sun goes around the Earth, or that time was an absolute quantity, but scientific theory supported by observations overturned that flawed worldview. Back into the (virtual) air, after a few days of distractions on the road in Death Valley, and the aftermath of catching up with grading tests and such. I appreciate all the nice comments and encouragement, and I find blogging to be a lot of fun. I am enjoying reading the latest entries into the Accretionary Wedge Carnival, hosted this month by Lounge of the Lab Lemming. Today's photo was taken moments after take-off from Calgary on our way home from a great visit to Banff, Jasper, and the Burgess Shale in 2005. It is in part of the Overthrust Belt of the Canadian Rockies although I am not sure of the precise location. I found this photo striking primarily for the powerful contrast between the aerial view and what it must look like from the ground. The rocks are probably Paleozoic carbonates which have obviously been deformed to nearly vertical dips. My jaw dropped as the ridge became visible (and was I ever thankful for the nice weather...it had been socked in and raining the day we flew in). Geological Things That Make Me Go "Hmmm?" Lounge of the Lab Lemming is the host of this month's The Accretionary Wedge carnival, and the topic of the moment is (geological) things that make me go "hmmm?". I've been mulling this one over for days on end, and although I can think of a number of geological phenomena that are mysterious and intriguing, it turns out that the thing that makes me go "hmmm?" is this: Why don't more people go "hmmm?" How and when do children lose their sense of wonder and become jaded and cynical grown-ups who are willfully ignorant about all things scientific and geological? When do volcanoes and dinosaurs and planets become unworthy of attention? I teach at a community college, and I encounter students from a great diversity of backgrounds, and almost without fail, they wait until the last semester to take a science course because they are afraid that the class will be "hard" and "boring". Andy they almost always say "I'm just not a science person". Their image of scientists is worse; they are white old men in lab coats (and no, I never wear a lab coat; and I'm only sort of old and white). It has literally become my mission to try and shake them out of these stereotypes; the first week of class is a celebration of how lucky we are to be living in these times when we have access to more knowledge than any other humans who have ever lived. We are seeing pictures of planetary surfaces that no one has ever seen before. We are discovering new species of dinosaurs and other weird strange creatures every day, and the roster of newly discovered living species continually surprises us. It seems like every child goes nuts at some point over dinosaurs at the very least, but kids just hunger for information about volcanoes and crystals and earthquakes. But somewhere, I think just past 5th or 6th grade, that sense of wonder disappears. It takes a lot of work to bring it back. I have to literally drag some of them into the wilds, and in a few precious instances, that spark returns and after a few minutes they are crawling and searching for an elusive trilobite. They have forgotten for a few moments that they are grown-ups and all past getting excited about seeing a fossil on the ground, a fossil that no human has ever before seen until that moment. And the moment of discovery is something that stays with them for a long time. So why do the kids lose interest? Is it hormones? Is it the peer pressure? I don't know. But I do know that one of the greatest benefits of teaching is that I am somehow involved in getting that sense of wonder back; it's not what I do, it is the earth itself that fascinates. Update: not only do people willfully ignore the wonders of geology, they actively search out fringe ideas and conspiracy "theories", and are depressingly open to "believing" just about anything. Check out Expanding Earth and the Conspiracy of Science at Dynamic Earth (http://dynamic-earth.blogspot.com/) for a great example and discussion. California State University, Stanislaus will be hosting Cal Paleo, a state-wide Paleontology conference this semester. The conference will be on Saturday April 19 in Naraghi Hall of Science from 9-5. 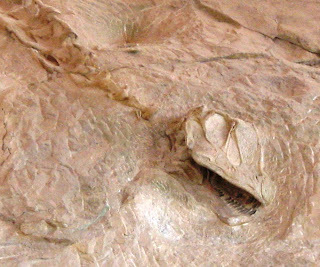 Since paleontology is by nature interdisciplinary, expect talks and posters on topics ranging from paleoecology, evolution, geology, paleclimates, dinosaurs, anatomy, and on fossils ranging from China to California (such as the Pleistocene mammals and salvage efforts at Fairmead Landfill near Fresno, etc). There will be a full day of talks, posters, an invited plenary speaker (world-famous dinosaur paleontologist and public educator, Dr. Scott Sampson), and a published abstract volume. Magnitude 6.0 Quake in EASTERN Nevada? How strange is that? The quake, which struck this morning, had a magnitude of 6.0, and caused some rather extensive damage in the historic downtown district of the town of Wells. Something like 25 building facades were damaged, and 3 people suffered minor injuries. The quake is a surprise if you consider the history for the region. Out of nearly 76,000 recorded quakes through 1992, there are barely any recorded in the northeastern part of the state. 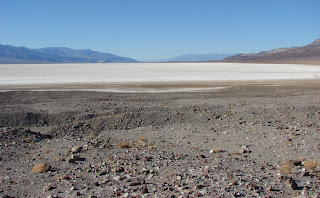 Although the mountains there resulted from basin and range style normal faulting, most of the action occurs at the margins, along the Sierra Nevada, and in a zone extending from Winnemucca into California. I noticed a lack of aftershock activity at first; I wonder if it is because of sparse seismometer coverage in the region. I offer best wishes for a quick recovery and rebuilding for those in the affected region. 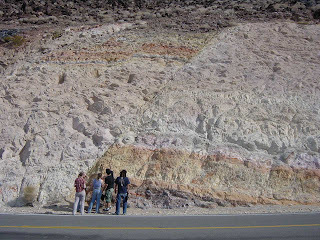 It is one of my favorite parts of the world as far as geology is concerned. The picture below is from our 2006 Pacific Northwest field trip, showing the Ruby Range just south of Wells, and not far from the epicenter of the quake. It was considered for inclusion into Great Basin National Park in the 1980's. So, What's Been Happening in the World? And Why is it always Florida? Sort of like Lois Lane in Superman II, after she had her memory wiped by the Man of Steel, I re-enter the world after five days in the wilds of Death Valley blissfully ignorant of world news (the picture above is from deep in Titus Canyon; you must see this place!). I go on the internets and find that there have been elections and primaries, $100/barrel oil prices, earthquakes, and Florida education officials thinking they are cute by linking the word "theory" with the word "evolution" (as was pointed out in Princess Bride..."You keep using that word. I do not think it means what you think it means. "). Check out some of the updates on this issue at http://www.flascience.org/wp/. The contributors at the Panda's Thumb (http://pandasthumb.org/) have been on top of the Florida evolution controversy. On the one hand, the state education standards for the first time include the words "theory of evolution", instead of the timid "change over time". This could be considered a victory of sorts, except that as always there is a huge difference in what "theory" means to scientists, and what it means to laypeople. Evolution is indeed a theory, in that it has been confirmed by loads of evidence, it explains the origin of many diverse phenomena, and competing hypotheses have fallen by the wayside over the last century or two. On the other hand, when I ask students to use the word "theory" in a sentence, I tend to get "We don't have to believe that, it's just a theory". And very few of the treasures are of the monetary kind. Mosaic Canyon, at the north end of the Panamint Mountains is a treasure trove of learning opportunities at all levels. In the picture above, students witnessed a rare sight of flowing water in a desert wash (after an overnight soaking in our campsite; no one really cared, it was the last day). 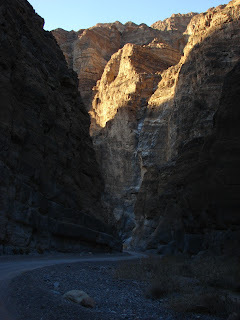 We could watch the pebbles rolling down the channel, and it was easy to imagine one of the large flash floods that have carved the intricate narrows just upstream. The canyon walls are adorned with the "mosaics", chunks of yellow dolomite marble that were once cobbles in the stream bed. They were later cemented, and then eroded by later floods. Understanding their origin was the goal of the student projects while they wandered up-canyon. The canyon lies at the edge of a metamorphic core complex, Tucki Mountain, and numerous faults are visible on the walk up the canyon, including one of the sweetest pictures of a normal fault one could ask for. The yellowish rock forming the canyon wall is the late Proterozoic Noonday Dolomite, a carbonate shelf deposit recording the subsidence of the recently rifted passive margin of the western edge of North America. 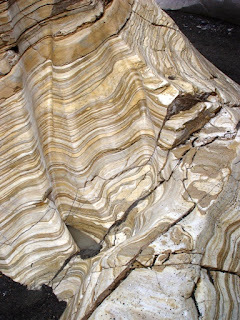 At first glance, the rocks appear simply tilted, but closer observation reveals complex folding patterns. The Central Valley of California is not one of the grandest places to be in the world in February, although I am sure that my friends in snow country might disagree, but frankly, it's not very long before the fruit trees bloom, pollen fills the air, and my hay fever goes hypercritical. When this all happens, I realize I have to get out of town. So...I am dragging 15 or 20 students out of the classroom, and we are headed to Death Valley for a long weekend! There is no place in the world quite like DV...the oldest rocks in California, evidence of the Proterozoic snowball earth, 36,000 feet of Proterozoic and Paleozoic sedimentary rocks, detachment faults, strike-slip faults, turtleback faults, thrust faults, a two mile deep fault graben, the hottest and driest place in North America, the lowest place in North America, four species of fish (?! ), and that is only scratching the surface. Continuing a very short series on the Channeled Scablands, this photograph shows several isolated hills and small mesas of the Palouse Soils. It is obvious given the irrigation circles that they are arable, and are well-known for their fertility. The Palouse soils are composed of a layer of loess (wind-deposited silt) that formed during the Pleistocene ice ages. 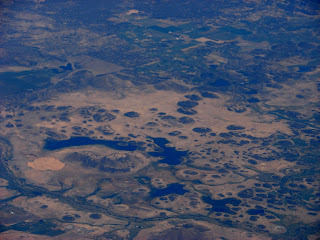 During the floods caused by the glacial dam collapse in Montana (see the previous post), these low hills were islands in the midst of widespread catastrophic flooding. I am not sure, but I think I see some of the giant ripple marks just below the center of the picture in the widest part of the channel. Normally just inches high in a river, some of the ripples on the Scablands are 30 feet (9 meters) high. Their size is related in part to the volume and velocity of the flowing water. I will try to confirm on Google-Earth when I get a chance. I can hardly begin to imagine what it would have been like to witness one of these floods...I live on a massive floodplain, and we had an estimated 250-year flood in 1997, and as terrifying as it was, it didn't even come close to a small fraction of a percent of the volume of water on the Scablands. Imagine if you can a flood that equaled the flow of all the rivers in the world...times 10. In some places the water was hundreds of feet deep, even more in narrow canyons, and backflow alone flooded practically the entire Willamette River Valley in Oregon. Giganitic chunks of glacial ice floated along in the flood, leaving huge dropstones here and there. Back to some normal picture blogging; there were lots of great photo-mysteries on Friday (Geopuzzles, Friday Field Fotos 1 and 2 , Weekend fun - picture time!, and of course, the Airliner Chronicles). This photo reveals part of a very famous geological mystery that has become one of the fabled geological stories of perception, persistence, and persipiration-inducing field work. In the 1920's, geologist and teacher J. Harlan Bertz began to wonder about the strange landscape on the Columbia Plateau between the Cascades and Idaho. Termed by Bretz the Channeled Scablands, the terrain was punctuated by intricately carved channels in the basalt, where a thick covering of loess deposits had been obviously and clearly eroded way by large rivers. There are huge potholes and giant ripplemarks, and dry waterfalls with no obvious water source. Harlan Bretz realized that the features must have resulted from cataclysmic floods involving hundreds of cubic miles of water, beyond the scale of anything ever seen in previous geological studies...anywhere. Although his conclusion is easier to visualize in satellite and aerial photos, Bretz managed to do it when such technology was unavailable. He walked the outcrops, and figured it all out from ground level. That was only the beginning of the story. Bretz figured out that giant floods had carved the Scablands, but he knew of no sources for the vast quantities of water required to produce said floods. And in a time of geological controversy over evolution (some gentleman named Scopes) and uniformitarian philosophy aligned against catastrophism, his conclusions were fiercely contested by the geological community, who proposed various less intense processes to explain the features. 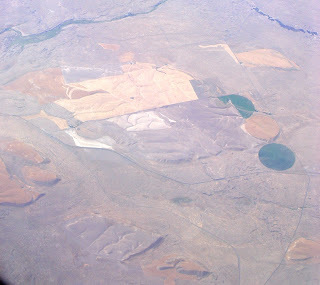 The Scablands remained a controversial issue for four decades. J.T. Pardee, working in Montana, had found a source for the floods in an immense glacial dam that blocked vast amounts of water in western Montana (Pleistocene Lake Missoula). It drained catastrophically as the inherently unstable ice dam broke up numerous times. But still, the geological community had a hard time accepting such an incredible and incomprehensible hypothesis. 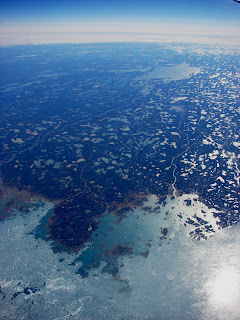 The evidence continued to accumulate, and with advances in remote sensing (like putting satellites in space), the reality of the ice age floods became more acceptable to the scientific community. Harlan Bretz eventually was recognized for his tenacity in the face of vigorous opposition. In 1979, the Geological Society of America awarded him the Penrose Medal for his contributions to geology. He was 97 years old at the time (he passed away in 1981). The photo of the day was taken on a flight home from Paris in 2006. 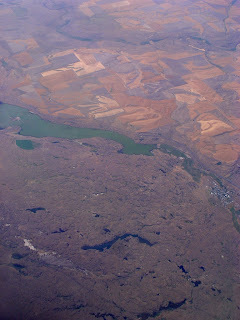 It was the first time I had seen the Channeled Scablands from above, and they were a stunning sight. 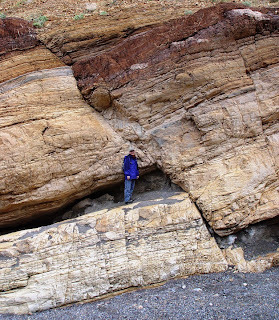 I teach by standing on the shoulders of giants (to borrow a concept from Isaac Newton)...I am awed at the perception and insight that Bretz brought to his work, and really, to the work of all the researchers who toil in the field of geology. They have done, and continue to do things that I can only barely imagine. I enjoy telling their stories, in hopes that those in my classes will be inspired to push beyond their perceived limits and discover new and wondrous things about our little planet. Dinosaur National Monument getting the shaft? A few days ago, I pointed out the potential role of the geoblogosphere as an avenue for disseminating information to as many people as possible on issues related to geology and politics. 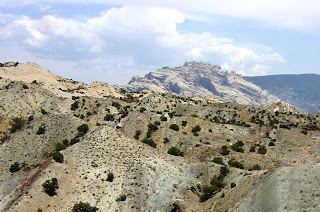 I came across this post from Dinochick Blogs, Help save Paleontology at Dinosaur National Monument that seems to fit the bill. It seems that our national parks are the adopted step-children of our federal government, and they seem to appear first on the chopping block when budgets have to be cut. There is an active community of paleontology bloggers who I am sure will get involved with this, but for my part, Dinosaur National Monument is an excellent field trip destination for many reasons, not just a display of dinosaur bones on a cliff (and even the building housing that display has been allowed to languish to the point of condemnation). Check it out and be heard on this! Many of the details of Mt. Shasta's complex history are summarized nicely by Bill Hirt at http://www.siskiyous.edu/Shasta/geo/index.htm. The small hills and ponds are part of the hummocky topography produced by a giant debris avalanche that broke loose from the north flank of Mt. 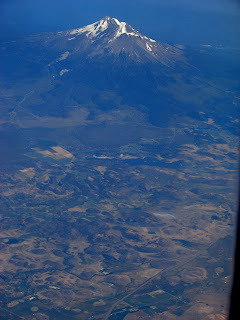 Shasta Version 1.0 or 2.0 (Note that the modern Mt. 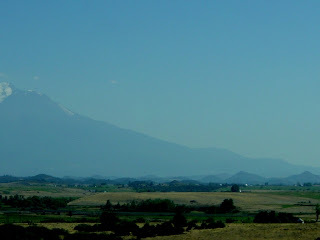 Shasta is something like version 5.0; Sargents Ridge, Misery Hill, and Shastina are all earlier volcanoes that preceded the young summit called Hotlum Cone). 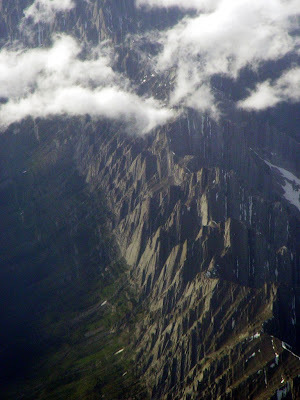 The topography, seen from the air in Picture of the Day - The Airliner Chronicles Part 11, was an enigma to geologists until 1980 when the debris avalanche thundered off of Mt. St. Helens, producing a similar topography in the Toutle River Valley. The Shasta avalanche was much larger, traveling some 55 kilometers, making it one of the biggest ever documented. Here is one more photo showing Shasta (the two summits are Shastina and Hotlum Cone), and a portion of the debris field along Interstate 5. Good job, Ron! I've been flying you all over glacial landscapes of Canada and Greenland the last couple of days, but for a brief change of pace, here's a bit of a geological mystery from the air. It's in North America, and if someone doesn't recognize it right away, and if no one tries to solve it, I'll toss in some clues later. There is an interesting story of geological assumptions and perceptions associated with this region. Have at it! Back to the air...sorry, no context for this one, because United doesn't provide a GPS tracker. I can only say it was in northern Canada somewhere, and southwest of Baffin Island. 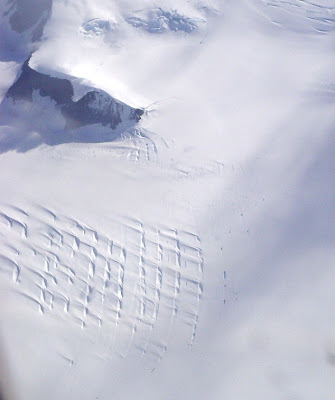 I dunno, do continental glaciers have any influence on a landscape? And just what is a deranged stream pattern anyway? Lots of kettle lakes here. Brian at Clastic Detritus asks about what the science blogs are, and whether they seem to fall into categories: blogs about science, or blogs by scientists? It's an interesting question, and I don't think I've been here long enough to put myself in one category or another. Mostly I started this blog after spending a great deal of my online time following politics in the blogosphere, and realizing slowly that we now have an alternative form of communication that has some great potential in my field of education and earth science. Consider that in politics, blogs pretty much didn't exist in the public conciousness prior to the presidential elections in 2004, but they have grown in influence to the point that many people get their news there instead of the mainstream media, because of a perceived corporate bias (take your choice, left or right). These blogs have been able to influence the direction and intensity of public discussion on a number of important political issues, and have even successfully changed the expected results of a number of elections (just ask Joe Lieberman in Connecticut). The blogs have become a sort of ultimate democracy, and sort of an ultimate anarchy at the same time. You have to be able to filter out the accurate information from the garbage. I have been watching the fledgling geoblogosphere from the margins for the last year or so, and was disappointed that it didn't seem to include much of anyone at first beyond Andrew Alden's About Geology (apologies to everyone I missed...), and I sort of wandered away during a very busy spring and summer, and when I came back, I found that the number of interesting and active geoblogs had vastly increased. What is the role of the geoblogosphere? At conferences and in the journals, our science is presented in a very formal way, and there are the very appropriate guidelines and buffers and peer reviews that promote an intellectual honesty that our science disciplines must maintain at all costs. I love going to conferences when I have the chance, but I also note the some of the best parts of the attending these gatherings is the chance to meet other teachers and other geologists over coffee or beer, and getting to know them as individuals and friends. We can toss out our opinions and jokes, and trade teaching ideas, all in an informal atmosphere of give and take. As I observe the Accretionary Wedge carnival, and the Where on (Google) Earth contests float through the geoblogosphere, I realize that I am participating in the same kind of friendly communication that I previously did during the off-moments of conferences. It is a chance to find out something else about our colleagues that doesn't emerge in a formal paper or session. Sometimes just plain fun, but I also see great potential for a rapid mobilization when major issues arise. I am remind, for instance, of attempts to shut down the USGS to save a small, small portion of the federal budget. I can recall a few times when very famous geologic outcrops were threatened by short-sighted road beautification projects. It is good to know that if such problems arise, a concerted effort by geobloggers can make a significant difference in resolving the problem. In my own case, it really boils down to the fact that I have a whole bunch of pictures that I want to share, and I enjoy discussing geological/educational stuff in a setting that allows for informality and the occasional stupid comment (NOVAblog, I was kidding about the coal-burning power plant). I've been enjoying it so far, and hope to continue making contributions. And I would really like to see more people make the plunge and start their own geoblogs. There should be more of you participating, both students, teachers and researchers. I found it to be a very straight-forward process starting and adding to the blog, and truly a lot less hassle then maintaining my formal website. It actually is a great deal of fun. I am living proof that you don't have to be particularly smart or sophistocated to do it. Hat-tip to Kim at All My Faults are Stress Related for this link to Steven Reynolds and company at Arizona State University and their internet exercise on understanding three dimensional structures: Geoblocks 3D. It is a great use of graphics that goes a huge step further than chalk drawings of folds and faults. Check it out! This is too good to pass up! Lab Lemming has definitive proof that the Giants DID NOT win the Superbowl yesterday. Check it out: Global warming skeptics claim Patriots win Superbowl. It is an inconvenient truth that all those sports writers got it wrong. If anyone wonders why I teach at a community college, and why I don't dabble much in research, it would be because I have a scientific version of attention-deficit disorder: as soon as I start concentrating on one subject, something interesting pops up somewhere else, and I explore it for a few weeks, and then get distracted by something else. My students love it; there is almost always some weird tidbit of information that will pop up in classroom discussions. And hopefully it is a disorder that works well with running an interesting geoblog. I was reminded of this when I saw this article in National Geographic News (Ancient Lion With "Bolt Cutter" Jaws: Best Killer Ever?) 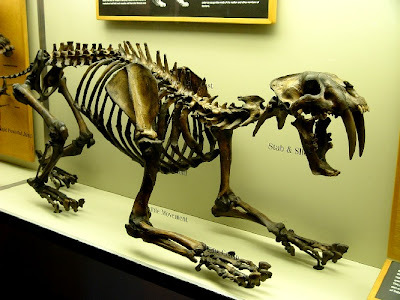 about the Australian marsupial version of a lion(Thylacoleo carnifex). Apparently, the creature had one of the strongest bites of any carnivore, and those cuddly kangaroos once had a most fearsome predator in their midst. In fact, they had more than just one. Generally, when students are presented with the biographical evidence for plate tectonics and continental drift, it involves a discussion of mammal-like reptiles, and the distribution of the glossopteris flora across the southern hemisphere. This makes sense, given the role they played in Alfred Wegener's fight to have continental drift accepted as a plausible scientific hypothesis. On the other hand, the story of the marsupials is a fascinating tale of journeys across vast continents, incredible adventures in successful adaptation, and horrific tragedies of extinction in unlikely places and times, as well as the on-going extinction event that is seeing the probable disappearance of koalas, tasmanian devils, and others. After a discussion of which continent has been isolated the longest, most students guess Australia, on the basis that the continent hosts the most unique mammal ecosystem, the marsupials. I am then able to point out that the ecosystem was once much richer. For nearly every animal filling an environmental niche in the more familiar climes of Europe and North America, there was an equivalent creature in Australia. For the antelope and deer, there are kangaroos and wallabies. For mice and rats, there are opossums and marsupial mice. For cats there are quolls. A stretch, perhaps, but for pigs, there are wombats. For foxes, we find the Tasmanian Devil. Less than a century ago there were Tasmanian wolves (hunted to extinction by 1930). 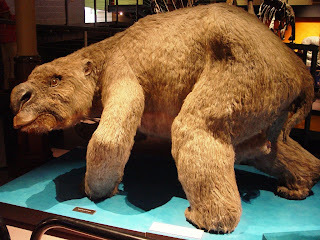 In the paleontological record, we find a 3-ton marsupial buffalo or cow equivalent (diprotodon), and the subject of the linked article, the Marsupial lion, Thylacoleo carnifex. There was even a carnivorous species of kangaroo (Ekaltadema ima)! The next obvious assumption is that marsupials originated in Australia. Why not? It makes sense that the most complex ecosystem of marsupials on earth must have arisen on the continent where they are found today. But they did not originate there, and were in fact relative late-comers to Australia. The oldest marsupials known are reported from China, from Mesozoic time. My students immediately assume these marsupials got to Australia via the Indonesian Islands, which brings up the Wallace Line, which is a clear demarcation between many kinds of animals that exist on either side. The concept dates from the 1800's, and is in fact the work of Alfred Wallace, of evolutionary theory fame. The reason is tectonic. The continents are currently moving closer, and have been much further apart, making island-hopping essentially impossible. 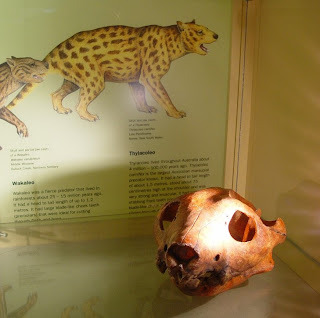 South America once supported a thriving marsupial ecosystem, including a marvelous example of convergent evolution in the existence of a sabertooth marsupial cat. It survived until around 4 million years ago, when the isthmus of Panama linked north and south America, allowing predators, especially the big cats, to move south, and treat South America like a giant buffet. The marsupials were decimated for the most part. On the other hand, the marsupial rat (the Virginia opossum) thrived in competition with North American placental species, and expanded its range into the United States.